The AME7739 is a Charge Pump voltage converter that delivers a regulated output. No external inductor is re- quired for operation. Using three small capacitors, the AME7739 CAN deliver up to 60mA to the voltage regu- lated output. The AME7739 features very low output ripple and high efficiency over a large portion of its load range making this device ideal for battery-powered applications. Furthermore, the combination of few external components and small package size keep the total converter board area to a minimum in space restricted applications. The AME7739 contains a Thermal Management circuit to protect the device under continuous output short cir- cuit conditions. The AME7739 is available in SOT-26 package and is O O rated from -40 C to 85 C. By AME, Inc. This is one package pinout of AME7739,If you need more pinouts please download AME7739's pdf datasheet. 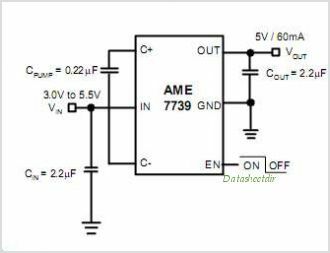 This is one application circuit of AME7739,If you need more circuits,please download AME7739's pdf datasheet.